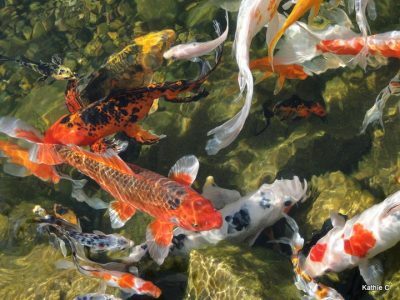 A properly designed ecosystem pond has 5 healthy elements that are essential in maintaining proper balance throughout the system. This is the pump and it is the heart of your pond. It needs to circulate constantly, 24/7, allowing your pond’s entire volume to recirculate once every 2 hours minimally. Comprised of mechanical and biological filtration, these filters clean in the pond in 2 ways. The mechanical filter acts much like a swimming pool skimmer, removing any debris that falls or gets blown into your pond. Biological filtration simply put, keeps the water clean through an up flow style filter separating the suspended particles first and then through bio-media cleans the water with natural bacteria and enzymes. This element of the ecosystem pond is the most underrated component. The first thing the rock and gravel do is make your pond look natural, covering your pond liner and brightening the bottom. Secondly, the rock and gravel protect that liner from the UV rays of the sun thus extending the lifetime of the membrane. The third thing the rock and gravel do is provide mass amounts of square surface area for in pond filtration and allow planting in the pond without the need of unsightly pots and containers. Plants in the pond not onoly add great beauty and visual points, they are also there to draw nutrients out of the pond as firtilizer, shade the pond from too much sun and feed the living animals and insects of your pond. Fish are by far the most important aspect of the ecosystem pond. They feed the plants, eat the plants spawn in the plants but they become your pets. The fish can be trained to eat from your hand, come when you call them and even get personalities of their own. The perfect pets.